Find other destinations that offer GO Airport Shuttle or search for other transportation providers at Budapest (BUD) airport. All parking services are located at Terminal 1. Services include long and short term, oversized vehicle and bus parking. Book for reservation our shared ride van to experience the spin to the Museum of Applied Arts and reduce your transportation cost. Our private Van will offer you a classic ride to the House of Terror. Hire for airport transfers and door-to-door services at low costs. Do you want a pickup at any point when you are traveling to the Memento Park or the city Park? Our private Sedan provides this service. Hire and call for a quick transfer with the help of our expert drivers. Have you been wondering how you will have a quick arrival to the BUD airport at any time? We have to solution for that. Hire our private SUV for a pickup and a safe drop off. Our local personal drivers will ensure a safe and quick arrival at the Orczy-park. Call and within a short time one of our drivers will be there to pick you up. Do not struggle to get the best airport transfer and ground transportation services. Hire our private taxi for a spin in the Memento Park. Hire our high class limousine to offer you a luxurious and comfortable ride to one of the best partying sites such as the Party ahoy. You will also enjoy a huge benefit of discounts we offer our clients. Arrival and departure of our buses in the terminals is in one hour intervals. Our professional drivers will ensure a quick and safe arrival. Budapest Ferenc Liszt International Airport serves the Budapest, Hungary metropolitan area. "Ferihegy”, as the locals call it, can be a confusing place, if you don’t know where to go. This terminal map can help light the way for you. Budapest is a very large city and is also the capital city of Hungary. While travelign to Budapest you can view the Danube River and the hills of Buda. The front rows of the parking area closest to the Terminal are for the disabled. The first ten minutes in the short term lot are free for passenger drop off and pick-ups. Parking lots are within a three minute walk from the old terminal the main entrance of Terminal 2. Parking lots are open and maintained 24 hours a day. There are no onsite shuttles at this time disabled services are available with call ahead . Avis, Hertz and Sixt Rental Cars as well as several other companies have rental booths available inside the terminal for all of your rental car needs. 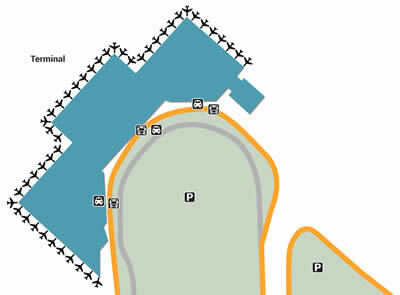 Rental cars are located outside the terminal to the right in the designated lot. Fo-Taxi is the contracted, onsite taxi company available with more than 50 cars on site throughout the day the airport requests that if you need taxi services, please only use taxis located in the rank for your protection . Mini-Bus is the onsite airport shuttle service from the airport to downtown Budapest. Minis can be found outside the terminal in designated marked areas and offer reasonable rates based on zones of the city. State Rail of Hungary is the local rail company; it no longer stops at the airport, however, the nearest stop is less than half a mile from the closed Terminal 1. Public busing runs from 4:00 am to 11:00 pm. The bus to downtown is marked 200 E and runs every 10-15 minutes. Budapest Ferenc Liszt International is located at Budapest , High Speed Road, Budapest, 1185 Hungary and uses airport flight code BUD. Created in 1938, Budapest Ferenc Liszt International Airport is the largest international airport located in Budapest. It is located less than ten miles from the heart of Budapest City. The airport sees an average of 7.5 million passengers yearly and contracts with more than 30 airlines, including Aegean Airlines and British Airways Airlines. It also services DHL, UPS and Fed Ex airlines for cargo shipments. There are two terminal buildings. Terminal 1 is no longer in operation. Terminal 2 is broken up into two concourses, Concourse 2A and Concourse 2B (terminal is in a V shape). The airport provides free wireless Internet access to all passengers with several charging stations. Comfort stations are spacious, clean and well maintained. Currency exchange stations are found past security checks in both Concourse. Disabled passenger assistance (wheelchairs and luggage carries) are available at baggage claim. Baggage carts are available at baggage claim for a small fee. There is a post office, first aid station, and a chapel all available, as well as child care services. Duty free shops are available past security checks. Dining fare includes Caprice, the Costa Café and quick food fare such as Burger King and KFC. The Airport Hotel Budapest is located less than two miles from the airport, offers a wonderful breakfast, reasonable rates and gives shuttle rides to the airport throughout the day. For those looking for luxury accommodations, consider the Fraser Residence Budapest, which offers a 4.8 stars of 5 rating, in room breakfast, laundry services, wake up services, a spa and complimentary shuttle services to the airport only eight miles away. Also the The Royal Palace is a popular attraction which has the National Gallery, The Fisherman’s Bastion and Matthias Church. You can also visit the Buda Hill Labyrinth or the The Sziget Festival at Óbudai Island which attracts rock fans to this August festival each year. When you need to find airport transportation to and from Budapest Ferihegy International Airport or BUD you can find private van shuttles and sedan services at discount rates.